Nearest: Tube Station: Piccadilly Circus 0.2 miles (0.4 km), Railway Station: London Charing Cross 0.6 miles (1 km), DLR Station: Tower Gateway 2.6 miles (4.2 km), Motorway: M1 Junction 1 5.8 miles (9.3 km). An amazing 7 underground stations within 0.5 miles (0.8 km) of the hotel. The Soho Hotel, a 19th century red brick building, enjoys a prime location in the heart of Soho in central London. Soho enjoys a bustling nightlife and is part of the area known as London's theatre-land with theatre after theatre with tops shows and international stars. Less than 300 yards from Oxford Street one of the busiest and largest shopping areas in London. Leicester square is just 400 yards away and Trafalgar Square is a similar distance . Close by is Regent Street with a wide selection of shops, stores, boutiques and restaurants. All of the major landmarks and tourist attractions are easily accessible . Other notable nearest attractions include the Trocadero Centre (0.2 miles), National Gallery (0.4 miles), Covent Garden (0.5 miles) and Buckingham Palace (0.9 miles). This ultra-hip hotel is located in a cobbled mews giving some respite from the busy surrounding roads. The Soho hotel has a large lobby area where 12 inch oak floorboards sit alongside metal framed windows and doors, pebble lined pillars and French fireplaces and a stunning 10 foot bronze cat by Botero. Bedrooms are individually designed in an open plan, contemporary English style with high ceilings and full length windows. Amenities include high speed internet access, flat screen cable LCD TV and DVD/CD player, desk, radio, safe, dual line phone, air-conditioning and Mini-bar. Bathrooms are luxuriously designed in granite and oak with walk-in showers, double basins and exclusive bath products. The hotel has four apartments that come with a full kitchen along with two bedrooms and a drawing room. These feature full height windows. Although part of the hotel and on the 1st and 2nd floors they also have the benefit of their private street entrance. The Terrace suites are on the 5th floor and have wrap-around balconies, drawing room and full height windows. Limestone bathroom with double walk-in shower. They have a kitchen and butler service. Soho Suite as Terrace suite with single walk-in shower. Junior Suites are each decorated individually by Kit Kemp. Granite and oak bathroom with walk-in shower and double basins. Onsite on the ground floor is the buzzy and trendy 'Refuel' bar and restaurant. Featuring a long pewter bar, specially commissioned mural by Alexander Hollweg and plants In Large Terracotta Pots. Serves contemporary European dishes, A La carte including fresh and organic ingredients. An all day menu of 'comfort food' is available with your drinks. The bar has three very distinct areas, the main bar area, a library with books and an area for the exclusive use of hotel guests. Wine is sold by the glass. Open 07.00 till midnight (Sunday 08.00 till 23.00). There is also a guests Library and a Drawing room. The Soho hotel has Conferences facilities in the event rooms, Some Of Which Occupy The Penthouse Level With Views Of The West End And Beyond as well as 2 cinema style screening rooms with business facilities. The Soho Hotel has its own fully equipped gym on the lower ground floor. Equipment includes cardio-vascular machines, free weights and exercise mats with a personal trainer on site. Two beauty treatment rooms offer a variety of treatments including full body massage, reflexology, facial, manicure and pedicure. The front desk is manned 24 hours and will loan out DVD films to watch in your room. Concierge services and fully air-conditioned throughout. Ham Yard Hotel: is 304 yards (277 metres) away, has a guest satisfaction score of 92% and rates start from about £360. Covent Garden Hotel: is 0.3 miles (0.4 km) from here, earns a customer rating of 99% and base rates begin at about £312. Charlotte Street Hotel: 0.3 miles (0.6 km), rated at 92% and with rates from around £259. Haymarket Hotel: 0.4 miles (0.6 km), rated at 99% and with rates from around £294. Milesfaster ranking: 8th from 866 London hotels, 1st of 8 Firmdale Hotels, and 5th of 131 five star rated hotels. Looking for lower base rates? Then another option might be the Grange City Hotel. 0.1 miles from the Soho Hotel (The) (0.1 km), achieving a rating of 82% by its past clients where rates start from approximately £111. Something close by with a great client rating? We suggest the 5 Star 41 Hotel may well be of interest to you being 3.0 miles (4.8 km) from the Soho Hotel (The). The 41 Hotel has a perfect unblemished customer rating 100%, a truly stunning achievement. 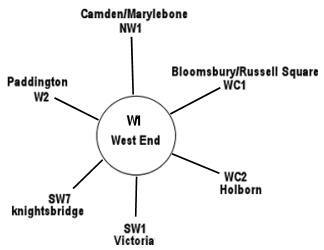 The fifty closest hotels from here (4 Richmond Mews, W1 postcode) that we have data for cover a 0.5 miles (0.9 km) radius. The 50 consist of 20 five star hotels (average rating 88%), 23 four star hotels (average rating 86%), 6 three star hotels (average rating 84%) and 1 two star hotel (rated 80%). Of these hotels the highest rated are Soho Hotel (5 star), the Covent Garden Hotel (5 star) and also the Haymarket Hotel (5 star) (all joint top with 99%). Base Rates: See how the area stacks up for low rates using base rates. We use published base rates but note these do not reflect special offers or short term discounts so remain a rough guide. We have calculated the average base rate for all the 50 nearby hotels at £184 per night. The low end of the scale shows rates from £18 at SoHostel (2 Star, 80%) to a high of £475 at Rocco Forte Brown's Hotel (5 Star, 90%). Rate averages for each star rating: Five Star average: £267, Four Star average: £140, Three Star average: £103 and Two Star average: £18. We rank hotels based on their guest rating but balanced for their influencing factors and we rank Soho Hotel 1st (joint) of 50 nearby hotels and 1st (joint) for the 20 five star hotels in the area. Compared to the nearest alternative hotels this hotel is 47th of 50 (17th of 20 five star hotels.) for base rates. Balancing the hotels rates and user rating we rank the hotel 4th of 47 when judging the balance of price point to user rating (SoHostel was top). Hotel was designed by Brits Kit and Tim Kemp and opened in 2004. Was previously used as a car park.